Dozens of Republican women gathered in the back dining room of a restaurant overlooking a golf course in Henderson late on a Tuesday morning in May for what should have been a rather refined affair, at least if the white tablecloths and glass water goblets had anything to say about it. 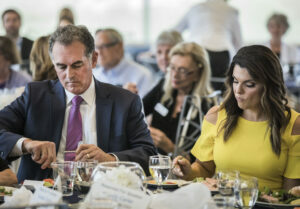 But, in what has become a hallmark of the Republican primary for Nevada’s 3rd Congressional District this year, an old-fashioned political tiff was on the luncheon menu. 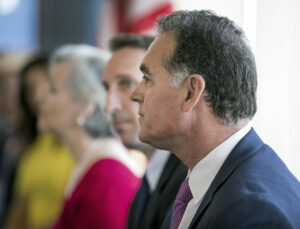 Of the 10 candidates who have tossed their names into the ring for the seat, which Democrat Jacky Rosen is vacating to run for U.S. Senate, the leading contenders are businessman Danny Tarkanian, state Sen. Scott Hammond and former television reporter Michelle Mortensen. The race is Tarkanian’s to lose, with his more than $900,000 fundraising lead and a name recognition advantage owing to his father, the late UNLV basketball legend Jerry Tarkanian. Those — coupled with the fact that Tarkanian has a history of winning primaries and losing general elections — has made Tarkanian the prime target of his primary opponents, with Mortensen the most vocal of the bunch, goading him during a debate by calling him a “perennial candidate” and re-tweeting critical comments from her supporters, including one who said he wouldn’t elect Tarkanian as a dog catcher. On that May morning, Niger Innis, the host of the candidate forum, asked Mortensen what she would do — win or lose come June — to bring a fractured Republican Party together and ensure that Nevada turns red again. She gave a lengthy answer focused on what happened when voters in Vermont in 1990, upset with Republican Congressman Peter Smith over his support for an assault weapons ban, voted him out and elected Independent Bernie Sanders, now a U.S. senator and former Democratic presidential contender, who Mortensen said has been a “nightmare” ever since. “Republicans have to unify. We didn’t do that in 2016, and it’s severely cost us,” Mortensen said. Innis then opened the question up to other candidates. “Now those things are not things that are good for the Republican Party,” Tarkanian said. (Tarkanian, leaving the event that day, told a Nevada Independent reporter he wasn’t sure he should have gone after Mortensen and that doing so may have hurt him a little. But he said the comments directed at his wife, Amy, bothered him. As the crowd began to murmur, Innis quickly and jovially tried to defuse the situation, asking state Sen. Scott Hammond to step in. Hammond, a former school teacher who lived in Alaska growing up, answered the question of Republican unity with a lesson he used to share with his students about crabs. It was a moment that brought the underpinnings of the race into relief. There’s Tarkanian, the businessman who has lost five bids for elected office since 2004 but whose conservative bona fides and family name have helped get him to the general election ballot four times. There’s Mortensen, the former television news anchor who has branded herself as the conservative firebrand bent on exposing the lies of the “fake news media” and the thorn in Tarkanian’s side, reminding him — and voters — about his prior losses at every twist of the race. And then there’s Hammond, the genial state senator who, while at times critical of his opponents, typically also has a nice word to say about them. While conventional wisdom would have Tarkanian winning the primary on Tuesday, a lack of public polling on the race means the race could still be anyone’s to win. Nevada’s 3rd Congressional District is the Silver State’s swingiest seat, wrapping around the Las Vegas Valley from wealthy, suburban Summerlin to wealthy, suburban Henderson and then stretching down to Boulder City and onto Searchlight and the southernmost tip of the state. Over the eight terms it has existed, Republicans have won the seat six times, while Democrats have won it twice. It also holds the distinction of having always voted for the winner of the presidential election since it was created, swinging for President George W. Bush in 2004, twice for President Barack Obama in 2008 and 2012 and for President Donald Trump in 2016. Republican Congressman Jon Porter was the district’s first representative, holding the seat from 2003 to 2009, until he was ousted by Democrat Dina Titus, who represented the seat for one term and now represents the 1st District. Republican Joe Heck defeated Titus in the 2010 election, representing the seat for three terms until he decided instead run for an open U.S. Senate seat, which he lost in 2016 to Democrat Catherine Cortez Masto. 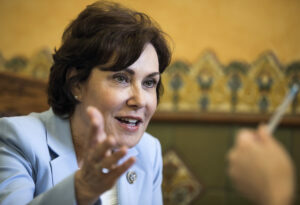 The district’s current representative, Democrat Jacky Rosen, defeated Tarkanian in the 2016 election and is now pursuing a bid for the U.S. Senate herself. That election was hard-fought, with the political newcomer Rosen beating out Tarkanian by 1.3 percentage points in a district Trump won by a single point. But it was a blue wave year for Nevada, with Democrats keeping the U.S. Senate seat, flipping two competitive congressional seats and taking control of both houses of the Legislature. Democrats initially struggled to find someone to run for the seat as a host of strong candidates flocked to the much safer 4th District seat, which leans left. Eventually, Rosen was recruited by outgoing U.S. Sen. Harry Reid, and throughout the race she was pegged as his handpicked puppet, with Republicans running ads of a marionette Rosen dancing upon stacks of hundred-dollar bills. But her background as a computer scientist and synagogue president and lack of any prior political history made it difficult for Republicans to lob any other significant attacks at her in the race. Ultimately, it turned out he was right. In some ways, 2018 may seem like a repeat of 2016. But it’s also a new year with new candidates. In fact, Tarkanian hadn’t even planned on running for the 3rd District again. He had set his sights on challenging Republican Dean Heller for his U.S. Senate seat after what Tarkanian described last summer as an outpouring of support from Republicans upset with Heller, particularly in the wake of the senator’s back and forth votes over whether to repeal and replace the Affordable Care Act. But, after seven months of Tarkanian campaigning against Heller, Trump ended it all with a tweet on the final day of the two week filing period in March. “It would be great for the Republican Party of Nevada, and it’s [sic] unity if good guy Danny Tarkanian would run for Congress and Dean Heller, who is doing a really good job, could run for Senate unopposed!” Trump tweeted. The fear among some Republicans was that Tarkanian had a decent shot at beating Heller in the primary but wouldn’t be as competitive in the general election against Rosen. Also, had he actually won, Tarkanian would’ve proven to be a thorn in the side of Republican Senate Leader Mitch McConnell, whose relationship with the president is reported to have considerably improved from last summer. 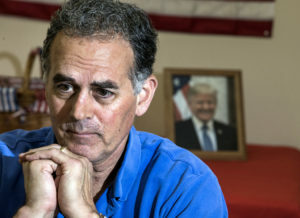 Tarkanian told the Independent at the time that he had “no intent or desire to switch races,” but that after speaking with his wife, Amy, he decided he had to do what the president asked. 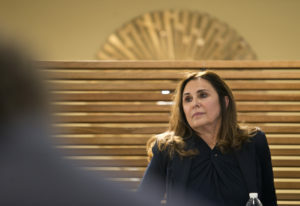 “She said, ‘You got in the race because you supported President Trump and his America First policies, and if President Trump asks you to do something, you have to support him,’” Tarkanian said. The announcement upended the race in Nevada’s 3rd Congressional District which had been shaping up as a fight between Hammond, Mortensen, former Assemblywoman Victoria Seaman and former Clark County Republican Party Chair David McKeon. McKeon said he decided to run in December 2016, while Hammond jumped into the race early last summer after Rosen announced that she’d be challenging Heller in the 2018 election, followed by Seaman later that summer and Mortensen in the fall. Seaman, who is a close family friend of the Tarkanians, dropped out of the race shortly after Tarkanian’s announcement and has since been actively campaigning for him. All of the other candidates opted to stay in the race. Generally speaking, the candidates agree on more than they disagree on. They all support the recent tax reform bill passed by Congress though they would like to see cuts to government spending; they think that whether or not marijuana should be legal should be left up to the states; and they all identify as pro-life. They’ve drawn some lines between themselves, though. Tarkanian, for one, supports a nuclear reprocessing facility at Yucca Mountain and has said that he would support universal background checks on gun sales and transfers. Mortensen has proposed a federal block grant of school safety funding to the states and doesn’t support Trump’s decision to ban transgender people from serving in the military. Hammond has been the most vocal about school choice, in light of the fact that he sponsored the bill creating Nevada’s version of the program during the 2015 legislative session, and, along with Mortensen, is the most open to a pathway to citizenship for DACA recipients as part of a broader deal on immigration including border security and other measures. With little daylight between them on policy issues, all of the top candidates — Tarkanian, Hammond, Mortensen and McKeon — have said they will support whoever wins the race, even if it’s not them. But that hasn’t stopped sparks from flying in the race leading up to the primary. During their first debate hosted by the Las Vegas Review-Journal, Mortensen derided Tarkanian as a perennial candidate while Tarkanian quipped that Mortensen had spent the last few years as a consumer reporter “doing reports on OxiClean and salad spinners.” They also fought over whether Trump really meant his tweet as an endorsement, which Tarkanian and his campaign have said he did. Hammond, asked the same question by the moderator about whether the tweet was an endorsement, phrased his answer more mildly. Later in the debate, Mortensen emphasized Tarkanian’s prior unsuccessful runs for office. “We can see who the real liar is. Maybe it’s the five-time loser. Or is it eight? I keep losing count,” Mortensen said. Tarkanian, in turn, made note of Mortensen’s consumer reporting, which varied widely from helping a man get a prosthetic leg to reviewing Kinoki detox foot pads. “While Michelle Mortensen was doing reports on OxiClean and salad spinners I was out defending President Trump on Fox News and MSNBC,” Tarkanian said, referring to his vocal support for Trump during his 2016 congressional campaign. On Tuesday, Republican voters in the 3rd Congressional District will have a final chance to select one of these candidates to represent them on the November ballot. Whoever wins will likely face Democratic education advocate and philanthropist Susie Lee, who hasn’t drawn any significant opposition from her primary opponents. But the other candidates have been squarely focused on Tuesday’s primary. 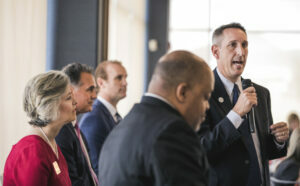 Hammond recently received an endorsement and a $1,000 contribution from the National Rifle Association in the race and the National Association of Realtors has spent nearly $42,000 in independent expenditures in support of Hammond. Meanwhile, the Fund for a Working Congress, which is funded by the American Policy Coalition and Ariel Corporation CEO and President Karen Buchwald Wright, has spent a little more than $21,000 on behalf of Mortensen. Those independent expenditures — coupled with the candidates’ most recent fundraising totals — are still dwarfed by the cash Tarkanian has on hand to spend should he feel he needs a last-minute boost. He has raised a little less than $1.2 million total so far and has a little less than $700,000 stored in the bank as of the end of the last reporting period at the end of May. Hammond, by comparison, has raised about $265,000 and has $54,000 saved, while Mortensen has received $131,000 in donations and has $41,000 in the bank and McKeon has raised $73,000 and has $5,000 on hand. Early voting for the primary election in Clark County continues through Friday. Voters can also cast ballots on the actual day of the primary, Tuesday, at any election day vote center between the hours of 7 a.m. and 7 p.m.
Disclosure: Susie Lee has donated to The Nevada Independent. You can see a full list of donors here. Update 6-8-18 at 8:41 a.m. to clarify that no retweets or likes of certain tweets by Michelle Mortensen currently exist online, though it’s possible for retweets and likes to be undone.